David Hembrow: Six year solar power anniversary: We're still pleased with the system. Six year solar power anniversary: We're still pleased with the system. We work from home and as ours is a web-based business we use computers a lot. Newer second hand computers replaced the older Pentium 4 based machines a few years ago and they consume a lot less electricity when in use. 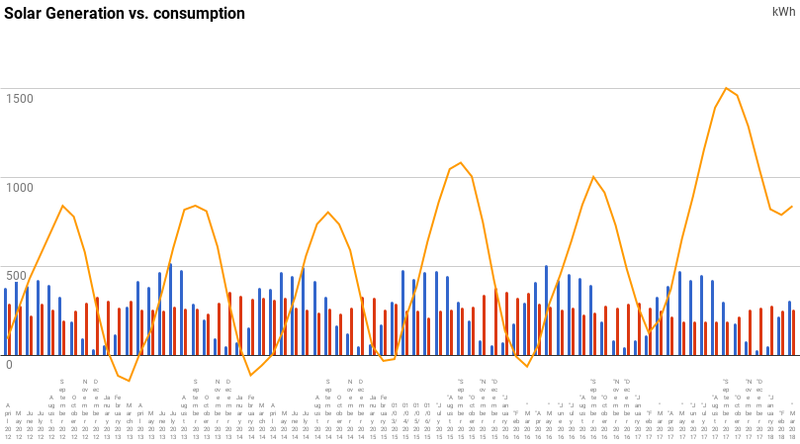 When I measured the usage of our computers and laser printers I found that they consumed almost as much electricity in the many hours when they were switched off as they did in the smaller number of hours when we were using them. The printer was especially bad in this regard. To counter this problem I installed an inexpensive switch which completely disconnects our laser printer and computers from the mains power when they're not in use. Almost all the older compact fluorescent lightbulbs have now failed and been replaced by LED lightbulbs. This made almost no difference at all. 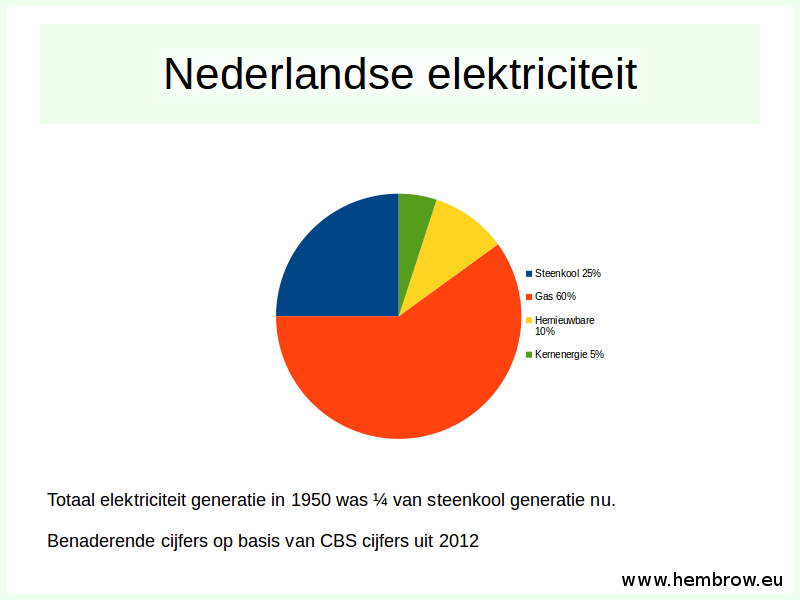 Our children left home, which made a dramatic difference to our total energy consumption. protesting against wind power here. 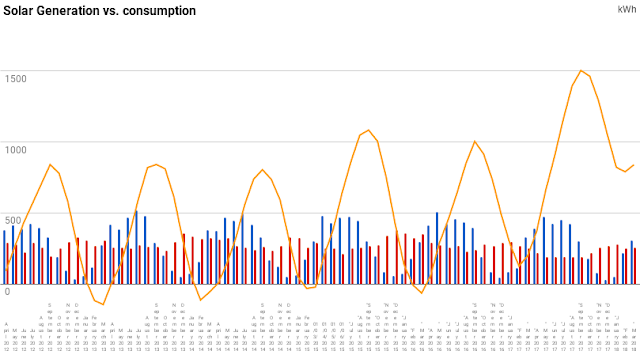 The blue lines on the graph show the production of electricity on each month. You'll note that our production in winter is far less than our consumption. On the shortest day in December our solar panels produced just 0.2 kWh of electricity. The peak output for that day was 111 W. That's from an array that peaks above 3900 W on especially good summer days. Output in winter can be as low as 1/40th of that in summer. At night time, whether summer or winter, the output of solar panels is zero. This is why solar power really cannot be used for everything. It's important also to have other green sources of energy to balance the supply. In the Netherlands that really has to mean wind turbines, though sadly some people don't seem to understand why that is important and there have been protests against wind turbines. The switch which I use to disconnect the computers and laser printer from the mains electricity cost about €1 to buy and has saved €100s of euros so far. This was possible because the standby consumption of the computer and monitor power supplies and, even worse, the laser printer, were surprisingly high. They totalled over 20 W. Not all such attempts make the same difference. Unplugging the likes of mobile phone chargers is completely pointless because their consumption is measured in mW. Unless something gets warm it's not consuming any energy. Have we been economically successful with solar power? When we installed our solar power system I predicted that it would take about ten years to pay for itself. After six years it now looks like it will take a little longer than predicted but not dramatically so, or uneconomically so. The price per kWh has varied over time but currently our supplier gives a value of 17 cents excluding tax, working out to about 20.5 cents per kWh including tax. 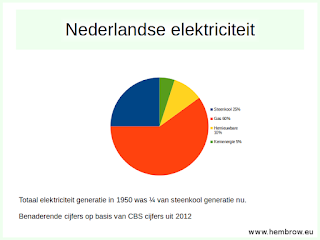 That values the 19997 kWh of electricity that we consumed at about €4030. Our overproduction is valued at only 7 cents per kWh meaning that this was worth about €55. i.e. after six years we've "earnt" about €4080 from the system and we're about half way to paying back the cost of installation. Rather than taking ten years to repay, it looks like it will actually take about 13. That's still quite good. It still easily beats putting the money in a bank account (especially with the low interest rates over the last few years). The panels are expected to last a minimum of 20 years producing their rated output so will continue to produce electricity well after they've been completely paid for. If you're considering installing a system now you will do better than us because the costs have come down considerably. Installers are now claiming that the payback period can be as short as five years, which may be slightly optimistic but this is still likely to be one of the best investments anyone can make. How long will the inverter last ? A friend of ours had a nearly identical system installed at the same time as us and his inverter failed a month or so ago. Perhaps our inverter will fail similarly. We expected from the beginning that the inverter would be the weak point: it's a hard working piece of power electronics. Luckily, inverters have dramatically dropped in price. The cost of replacing the inverter is expected to be about a tenth of the total cost of our system, so it will extent the repayment time by about a year. If we have to do this it will be annoying but it will still be worthwhile. What next for us ? We have made considerable progress on insulating our home, bringing dramatic results for our gas consumption. We've considered the idea of stopping use of gas altogether, cutting not only the €50 per month that we pay for gas but also the €18 fixed charges for the connection. If we switched to an electrical heat pump to replace the gas boiler for central heating we could eliminate this cost. Because we would no longer require the chimneys on our roof we could then install a few more solar panels instead to produce about as much electricity as our total consumption. Unfortunately this is currently impossible to justify because the repayment time works out as somewhat longer than the expected lifespan of a heat pump, let alone the other extra costs involved. For now we'll concentrate on continuing to make our home more energy efficient while waiting for a suitable more efficient non-gas heating system to become available. Elsewhere in Assen: A small section of what was claimed to be (when it opened in 2016) the largest solar covered motor bike parking facility in the world - at the TT track.